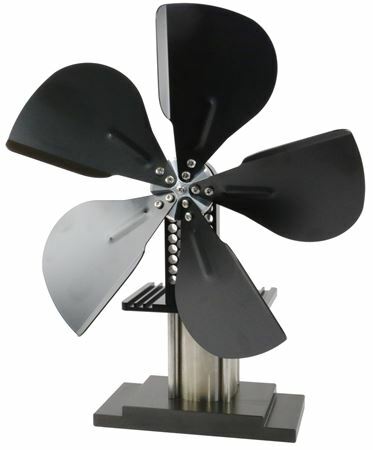 The Vulcan stove fan is a stirling engine powered fan that quietly and efficiently circulates warm air from your wood stove, coal stove or other heat source, through your home or workshop dramatically increasing the effectiveness of your heating appliance and improving your comfort level. No longer will you have to stoke your stove to blazing hot temperatures only to end up with a VERY hot area in the direct proximity of your stove and mildly warm air across the room. The Vulcan stove fan helps to uniformly circulate the air, leaving you a cozy, comfortable atmosphere to enjoy while reducing the amount of fuel your appliance consumes. In addition, the Vulcan costs you absolutely nothing to operate! 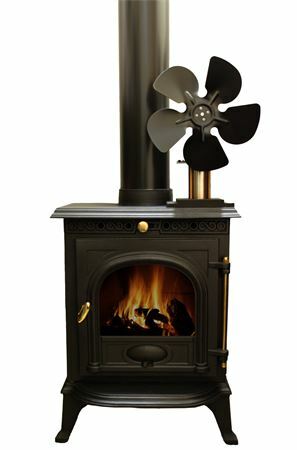 The Vulcan stove fan does not require any electricity whatsoever! No batteries. No mains electricity. The Vulcan is self powered just from the heat of the stove. 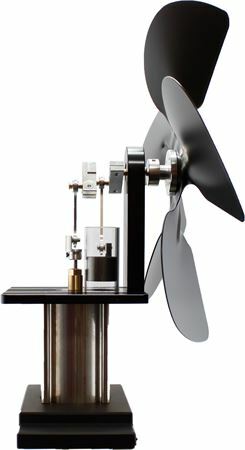 It utilizes a small, quiet Stirling cycle power plant built into the fan. Making it a very eco friendly fan. The Stirling cycle power plant obtains its power from rapidly heating and cooling the same volume of air. When the air is heated, it expands, pushing a piston upward; when the same volume of air is rapidly cooled, it contracts, pulling the same piston downward, providing power. The same volume of air is heated and cooled very rapidly converting the heat energy to mechanical energy used to turn the fan blade. The Vulcan's fan speed increases relative to the temperature increase of its heat source. So, the hotter your stove, the faster the Vulcan will run and the higher the volume of air circulated. The Vulcan stove fan uses the latest and best technology, including borosilicate glass cylinder, graphite piston and ultra low friction demagnetised bearings to ensure it is completely maintenance free. You never have to oil it ! The fan is named after the Vulcan god from ancient Roman religion. Vulcan was the god of fire. For further information about the fan visit the Vulcan stove fan website. Proven 200 year old technology. Works on about 97% of stoves.